Media Drug works like any of the other music players when it comes to playing music. You can play tracks individually or as a part of a playlist, repeat your favorite tracks, using the graphic equalizer options to customize the music according to your preferences and play the tracks in sequential or random order. All the controls for playing, pausing, rewinding and forwarding your music are located below the playlist. You can repeat your favorite track, album or artist according to your preferences. Select the track to repeat from the search results in the left pane or from the playlist in the right pane. Click on the repeat button once at the bottom of the playlist to repeat the track. The selected track will be repeated once. Select the album to repeat from the search results in the left pane or from the playlist in the right pane. Click on the repeat button at the bottom of the playlist twice to repeat the entire album. The repeat icon will be displayed with a cd to indicate that it is on "Repeat Album" mode. The selected album will be repeated once. 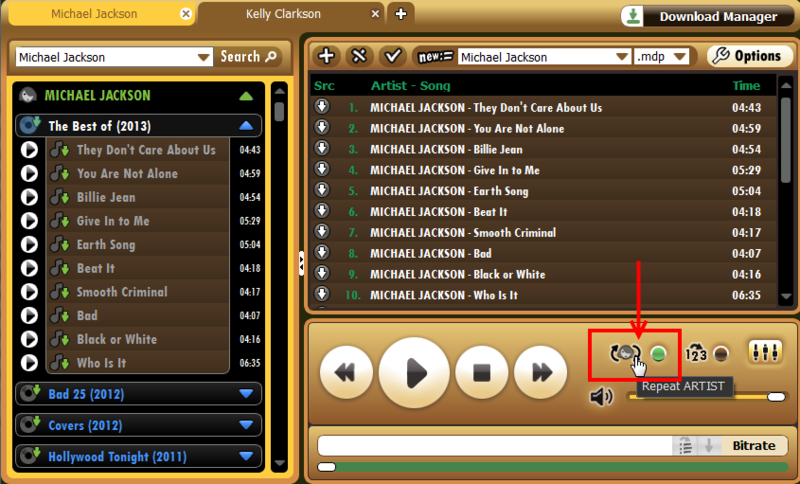 Select the artist to repeat from the search results in the left pane or from the playlist in the right pane. Click on the repeat button at the bottom of the playlist three times to repeat the artist. The repeat icon will be displayed with a person's icon to indicate that it is on "Repeat Artist" mode. All tracks by the selected artist will be played once and then repeated again. You can choose to play the tracks in selected playlist in sequential or random order. By default, the program will play all tracks in the playlist in sequential order. You can however change this to playing them in random order with a single click. Go to the bottom of the playlist and click on the icon with the numbers "123". The button adjacent to the icon will turn green indicating that random order is turned on. To go back to playing the tracks one after the other, click on the icon again, random order will be turned off. The graphic equalizer enables you to adjust music according your preferences. You can increase/decrease bass, treble, balance, etc to accentuate those aspects of the music that you are interested in. Click on the graphic equalizer icon with the sliders below the playlist. The graphic equalizer will be opened in a new window. You can adjust the levels manually or use one of the presets by selecting it from the drop-down list below the sliders. 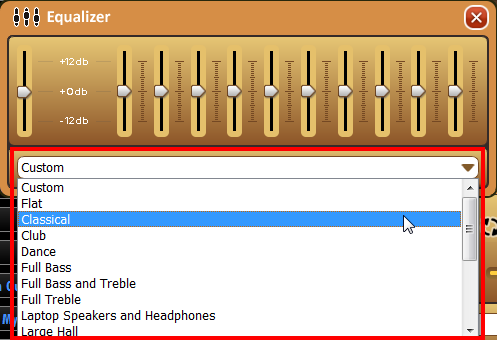 You can readjust or change these settings anytime by clicking on the graphic equalizer button. Use the volume slider control below the playlist to increase and decrease volume as needed. Drag slider to the right to increase volume and move it to the left to lower volume.